Massenet's Manon retells the sad histoire of Manon Lescaut, a gormless lass who goes from rural hick to grand Parisian lady to dying convict in the course of five fast acts. Here, Dell'Arte has platooned the show with La Traviata in a two week event billed as Violetta and Her Sisters, and continuing the mission of Dell'Arte music director Christopher Fecteau to provide a training space and stage opportunities for young singers who are, like the opera's heroine, at a way station en route to bigger things. First among those on the road to stardom is tenor Sean Christensen, cast in the challenging role of the Chevalier Des Grieux. His stage presence and supple tenor lent an air of resignation to this hapless hero, who veers in and out of Manon's arms with a brief side journey towards taking holy orders. Of course, he can't resist the heroine's charms, as expressed in powerful arias that rose brightly above the stave and captured the conflict of emotions that drives this character forward. This was a breakout role for a fine singer. Soprano Olivia Betzen was less impressive in the role of Manon, approaching this difficult part with a breathy, somewhat flutey technique that at first sounded girlish but ultimately proved grating. That said, she shone in the coach inn scenes of the first act, where the still innocent Manon falls instantly for Des Grieux and the two mad lovers engineer the theft of a stagecoach that is supposed to carry off a nobleman. Ms. Betzen impressed in the intimate second act, as the truth about Manon's corrupt nature was slowly and carefully revealed. Indeed her "Adieu, notre petite table" was Massenet at hs best, sentimental and yet musically compellin. She ran into trouble in the rarified upper atmosphere of the famous Act III Gavotte, but pulled the performance together in the long church scene and fourth and fifth acts. Here, the heroine is rescued from a chain gang bound for America only to die in her lover's arms. With these two artists, the trite sne became utterly absorbing. Baritone Stan Lacy leant a bluff good nature to Manon's distant but dastardly cousin Lescaut, a kind of Mephistophelean figure who leads Manon and Des Griuex down the rocky road to penury, ruin and death. 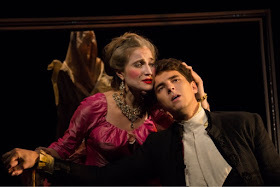 Mr. Lacy was at his oily best in the second act, where, aided by Brétigny (Nobuki Momma) he disrupts Manon and Des Grieux's domestic tranquility with the harsh truth of life in Paris. His charming, comic efforts to bribe the soldiers in Act V leant some much needed levity to this grim finale. Other standouts in this show included tenor Andrew Surrena in the villainous role of Guillot, and Mr. Momma as the slimy Brétigny. Mr. Fecteau's decision to use the original spoken dialogue created for the show's origins at the Theatre-Lyrique should also be commended: it is rare to here French opéra-comique performed with the proper contrast between dialogue and song. Finally, the Dell'Arte Festival Orchestra was taut and effective, with the high level of the players creating memorable musical accompaniment despite the necessary reduction in orchestral size.